May 10th 4-7 Annual Family Day BBQ. Join us for a fun time as we all join together. The Petting Zoo will be returning and food is provided. ASL interpreting available. May 15th 5:15 Annual State of Hillcrest Board meeting. As always, food and child care are provided. We look forward to having you come learn about the accomplishments of the past year, the plan for the next few, and the budget for the next year. More information will be coming in the newsletter. June 30th Last day to earn Volunteer Hours for the 2018-2019 year. Reminder all families have the option of volunteering 20 hours or buying out their time at $20 an hour. Thank you for a successful Annual Campaign! It is with great pleasure that we announce the results of first ever Annual Fund campaign for Hillcrest. Thank you to everyone who made contributions this year and encouraged friends and family to do so as well. When we kicked off the fall campaign at our Harvest festival, Hillcrest’s goal to raise $15,000 before the end of the calendar year. With the generosity of Hillcrest families and alumni families, we met that goal and raised $16,690! Then, we were overjoyed to receive a single gift of $20,000 from generous anonymous donors. Together, we raised more than $36,690 for Hillcrest this fall! A full 2018 holiday bonus for teachers and staff members. Every staff member received a holiday bonus this year, which is adjusted for the number of years worked. The bonuses were issued in December. The building maintenance reserve fund. The additional funds allow us to put more money into the reserve fund for upcoming major renovations, primarily the replacement of the building’s 60-year-old boiler and upgrading the center’s roof. These changes will keep the building safe and operating for years to come. We also want to thank all the families who shared their own personal experiences of Hillcrest: the Biastock Family, Norton-Cruz family, Duvall family, Elliot family, French family and Towns-Bain family. It’s Hillcrest families and children, along with our awesome staff, that make Hillcrest great! Thank you for your support of Hillcrest kids, and for future generations of families. We look forward to a great year in 2019. Thank you to all those families who were able to attend the Harvest Festival last Saturday! It was a wonderful evening of autumn celebration. It was an also opportunity to pause and reflect on why we’ve become part of Hillcrest and why we stayed after 7 years. 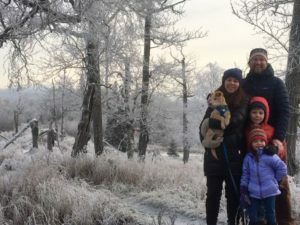 As the Bain family, we love Hillcrest because we know that when we drop our three-year-old off at preschool every day that he will be safe, loved, and respected. We know that he’ll eat healthy food prepared by a caring person. We know he’ll sing songs, play games, and interact with his friends, under the guidance of incredible teachers. We trust Hillcrest. And we’re grateful to have this place for children in our community. In that spirit, the Hillcrest Board has launched a new Annual Fund giving campaign to benefit our childcare center. The Board works hard to keep tuition low, and we need additional funds in order to keep up with maintenance on our aging building, as well as provide rewards for staff members. Hillcrest’s goal to raise $15,000 before the end of the calendar year. A building maintenance reserve fund. We need your help. We hope you’ll consider making a meaningful gift to Hillcrest in the next three months. You can make your donation by credit card at Hillcrest, or by dropping an additional check. You can also alert Christina to a pledge, who can add it to your monthly childcare statement. Your gift is tax deductible and Hillcrest will provide you with a receipt. We also welcome introductions to friends, neighbors, and other giving programs who may be interested in supporting Hillcrest. 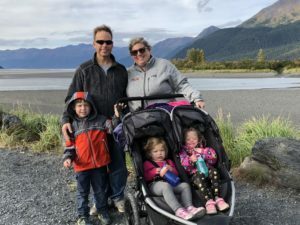 There are many good causes in Anchorage that deserve our charitable dollars—this is one that will benefit all our children, as well as future generations of Hillcrest kids. Thank you for considering a gift this year! Perhaps you are like me in that, aside from your home, Hillcrest is your most often visited destination in Anchorage. As my youngest child prepares for her start in kindergarten next year, joining her brother in 4th grade, I realize that my long relationship with Hillcrest Children’s Center is going to change dramatically next fall. Since first visiting when I was pregnant with my now 9 year old, I knew that Hillcrest offered the kind if care I wanted for my child. In addition to the amazing staff, many of whom have been at Hillcrest since my first visit, Hillcrest offers a true sense of community to its families. As a parent, I feel supported and I know that staff and leadership will always take the time necessary to talk with me about the many challenges and triumphs that children experience as they grow. Further, as I have enjoyed watching my son and daughter develop buddies at Hillcrest, my husband and I have also made lasting friendships over the years. It will be with heavy but joyful hearts that we will transition from active to “alumni” status next year, and I know that our connections to the Hillcrest community will remain strong. Like our family has evolved over the years, so has the Center itself. The Hillcrest team has gone to great lengths to make each classroom and shared space in our aging building a vibrant, joyful, and fun place for our kids. Similarly, I really appreciate not only the large outdoor space we have (supplemented with the many parks of Government Hill), but that Hillcrest so openly embraces creative outdoor play, and has designed their yard space to ensure our kids get to have fun outside every day. Because Hillcrest is and has remained such an important place for our family, I am giving to this year’s annual campaign. In addition to supporting necessary deferred maintenance and improvements for the 60 year old building, the annual fund will support holiday bonuses to the wonderful Hillcrest staff. The professionals at Hillcrest spend each day helping our kids learn, have fun, be nourished in body and spirit, and develop social and emotional skills in a supportive and loving setting – I am honored to help ensure they each get a year-end gift reflecting our gratitude. I ask that you please join me in supporting Hillcrest’s annual campaign. You can make a tax deductible donation via credit card, via Paypal, or by dropping a check at Hillcrest. Thank you for your consideration. I gave what I could to Hillcrest, knowing that it would support the amazing staff and building that I whole heartily trust with my child. My Hillcrest story starts with me as an employee. Hillcrest took me in right after high school and I was known, as Ms. Kim. Ms. Renee and Mr. Jim were my mentor teachers. They taught me everything I needed to know about caring, loving and teaching children. I remember my very first Hillcrest holiday bonus! It was cash that was collected from the parents, just like this Annual Fund Giving Campaign. It was a great surprise and I remember feeling so appreciated. When I became pregnant with Jordan I knew exactly where I wanted him to go. I told the office and got on the wait list at only 5 weeks pregnant. I knew that Hillcrest would provide my child with love, smiles, and memories that I also gained while working there. As a Kindergarten teacher now, I’m so thankful for the structure and social emotional learning that happens at Hillcrest. My child has made friends, learned songs and gotten messy! Hillcrest’s play-based philosophy is just what my busy boy needs. Hillcrest needs your help! Let’s show them some love! If you haven’t done so yet, please consider a donation that will help support this magical place! You can round up your monthly tuition, make a one-time contribution, add it to your monthly statement or simply use the pay pal link below. 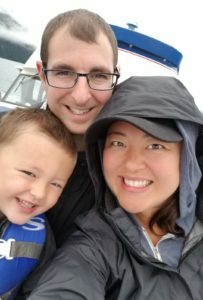 Today I made a donation to Hillcrest, as part of the Annual Fund giving campaign, that is sizable for my budget as a single/divorced mom of two, and I want to tell you why. I donated to Hillcrest because I love and trust Hillcrest This has long been the case – from first tour of the facility when our daughter, Ida Luna, was an infant, and the warm sun was streaming in through the curtains of the infant room while Mua and Anna gently talked us through what her days would be like, and we felt so at peace, to baby Rio’s early days in Ms. Reneé’s room and Ida’s transition to the large preschool room, where I pick her up and she’s so engrossed in make-believe or art that she doesn’t want to leave. But this loyalty to Hillcrest, this trust in them, feels especially poignant now after the earthquake. I can’t presume to know all the reasons why my children are doing relatively fine after that frightening experience and as we roll through the aftershocks, but I suspect is has something to do with the calm, caring, responsive way that the Hillcrest staff handled it. The fact that Ida could describe to me the hugs she received and the stories she read, the fact that I knew right away by text that my kids were safe, the fact that Rio was held and comforted afterward, this all sets my heart at ease, and I believe made a tremendous difference for my children. It makes sense that it would: it’s in line with the way that Hillcrest focuses on social-emotional learning, on attunement and attachment, on the importance of creating a sense of safety and tools for emotional self-control for children so that they can be free to learn. It’s in line with the “feelings buddies” and the peace corner and the emotional literacy lessons in preschool, the caretaking of babies that my 2-year-old gets to engage in. These are the things I love about Hillcrest – that I can drop my kids off early enough to get in a full day of work, and know that they are using that time to engage in play and learning with caring, attentive adults (and bonus points when Ida comes home teaching me new phrases in Samoan and Spanish that she learned from her teachers)! In order to maintain the things we love about Hillcrest, the Board has launched a new Annual Fund giving campaign to benefit our childcare center. The Board works hard to keep tuition low, and we need additional funds in order to keep up with maintenance on our aging building, as well as provide rewards for staff members. •A building maintenance reserve fund. statement. Your gift is tax deductible and Hillcrest will provide you with a receipt. We also welcome introductions to friends, neighbors, and other giving programs who may be interested in supporting Hillcrest, as an investment in healthy early childhood development for our community and our working families. 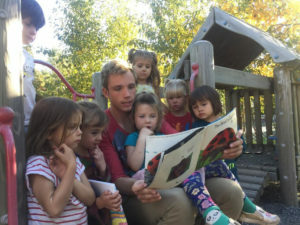 There are many good causes in Anchorage that deserve our charitable dollars—this is one that will benefit all our children, as well as future generations of Hillcrest kids, and the community in Anchorage needing high-quality childcare. Thank you for considering a gift this year! Mr Gabe, a Hillcrest alumni and current staff, reading to a group of children. I was asked to think about and share what Hillcrest means to myself and our family. Hillcrest has meant so much to us that it is hard to verbalize—our story is so different than most parents. It starts when we discovered we were expecting twins. We were stressed to try to find two infant care spots and we were relieved when we discovered Hillcrest. About a week before the babies were born prematurely, we discovered one of our children would be born with a significant disability. Greg immediately called our director Christina to let her know the news. With so much weighing on us, we were worried our baby would not be welcome at Hillcrest because of her potential significant needs. Christina reassured us that once accepted at Hillcrest you become a Hillcrest Family. She said we take care of you, and Hillcrest meets the child at whatever development stage they are at. You can imagine how relieved and grateful we were, with just one less thing to worry about. We had chosen a child care center that celebrates diversity of all types and accepts all families. We chose a center that lives inclusion. We chose a center where a child is not asked to leave if they are not toilet trained at age three. We chose a center that celebrates nature and play. We chose a center where children get hugs and love. We are grateful our children attend Hillcrest. As you know, Hillcrest is starting an annual campaign to benefit the center. Greg and I now serve on the Board of Directors. We’ve heard some questions about why our Annual Fund is needed now, and why the cost of tuition doesn’t cover all the Center’s expenses. Put simply, Hillcrest’s building has a significant level of deferred maintenance that requires additional fundraising to address. Tuition covers basic repairs but not the major repairs the building needs. Hillcrest has been operational for 50 years and the buildings are at least 60 years old. A portion of the annual fund will be used for pressing repairs, as well as savings to allow for the replacement of the boiler (and related flooring) and a roof over the original part of the building. 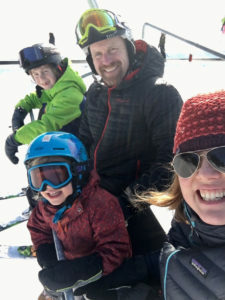 In addition, we would like to provide for an annual staff bonus for teachers and other needed items—specifically gear so teachers can be comfortable during the winter months while supervising our children outside. We hope you’ll consider making a gift to support the campaign this year. You can make a gift by filling out a pledge card at the Center and dropping it into the check deposit box or sending an email directly to Christina with your pledge. We would also appreciate your help in spreading the word about Hillcrest’s annual campaign to Hillcrest Alumni. Please share with alumni that Hillcrest is celebrating their 50th year of operation and we are starting an annual campaign for staff and building repairs to ensure Hillcrest is around another 50 years. We welcome donations from alumni. Any alumni can contact Christina or one of the board members for more details or how to give.